Stir together lime zest, lime juice, 1 tbsp soy sauce, fresh ginger, and sweet chili sauce. 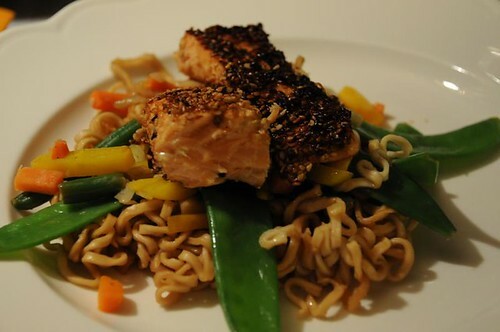 Coat the salmon pieces in this, and then in sesame seeds. Save the marinade! Bring a pot of water to boil, and cook the noodles according to the instructions on the packet. Don't over cook them! Add the snow peas for the last minute, then drain and rinse in cold water. Fry the salmon in oil on medium heat, about 3-4 minutes on each side. The sesame seeds burn fairly easily, so watch the heat. Heat more oil in a large frying pan or wok, and cook the vegetables for a few minutes. Add the noodles and snow peas and pour over the reserved marinade and the remaining tablespoon of soy sauce. Stir well for a minute or so, and then serve, with the salmon on top. Once I made someting similar with one half of the salmon pieces dipped in black sesame seeds and the other half in white.